As the holiday season is quickly approaching, many of you are desperately searching the Internet on the lookout for the perfect custom holiday gift – well we got you covered! 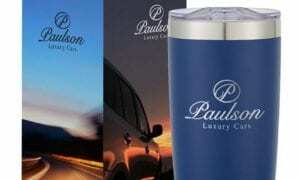 As a print and promotional business, we know what our clients are looking for, and we are here to help you select unforgettable corporate gifts for your clients and employees. The holiday season will be over before we know it, but the right promotional products ensure that your brand’s message will live on long after it’s done. The best products are not only useful but they foster interconnectivity between you and your clients. Promotional products are incredibly important and can be used as a powerful tool to help spread your brand. To help you get started, we’ve compiled a hand-tailored list of custom holiday gifts that will fit any budget, ranging from custom imprinted tumblers and drinkware to personalized greeting cards and winter apparel. This 20 oz., two-tone Himalayan tumbler can be customized with your brand, and it even comes complete with a custom box that’s perfect for wrapping! Pair it with a gift card to Starbucks or even a local coffee shop to add a personalized touch. It’s not the holiday season without cozy socks! 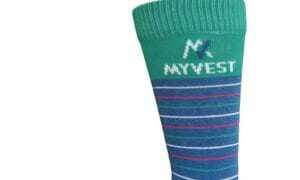 With over 30 colors available, these socks can be personalized with your initials, event logo or company name scattered throughout the sock. For even more flair, have them stuffed with other custom holiday gifts like branded pens, candy or gift cards. Remind your customers that your company knows how to have fun while getting all the business done! 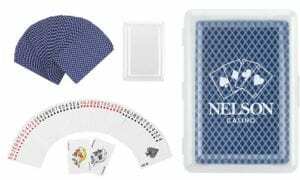 The deck comes in several colors and can be customized with a pad printed imprint of your company name and logo. Here is a terrific way to wine and dine both clients and employees. 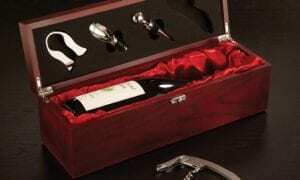 This rosewood finish wine set comes with four useful wine tools and a satin-lined wooden box with metal hinge and clasp. Add your logo to this sophisticated item to create a lovely gift for important events. 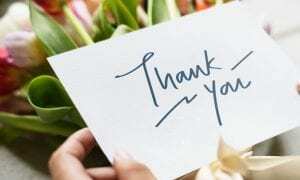 Send greetings that will keep your business top-of-mind! Beautifully designed greeting cards are a perfect addition to any custom holiday gift and are a great way to grow your business relationships. You can also customize your cards with the choice of verse, ink color, and lettering styles to make your card unique. When it comes to promoting your business during the holiday season, it goes without saying that you want promotional products that are as unique as they are powerful. Take full advantage of the opportunities that the holiday season presents for enhancing your company’s relationships with staff and clients alike with custom holiday gifts for everyone. Here at Davant we provide a wide variety of products and can surely meet any need. If you can’t find the custom holiday gifts you are looking for in this list of ideas, send us a message, or give us a call at (317) 849-6565 and we’ll see if we can find what’s on your wish list.